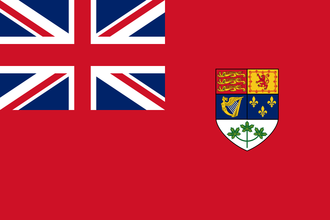 Canada is a British Dominion, member of the British Commonwealth, and regional power in North America. During the First World War, Canada automatically entered the conflict on the side of the Entente as a semi-independent dominion of the British Empire. With the Statute of Westminster in 1931, Canada was transformed into a sovereign nation, though remaining a key member of the British Commonwealth with strong ties to its parent country. Canada followed Britain's declaration of war against Germany on the 10 September 1939, its first independent declaration of war. Canada's military in 1939 was small, poorly-equipped, and technologically outdated, despite measures taken by the government of Mackenzie King in 1936 to gradually increase the gutted defense budget. After the outbreak of war, Britain placed responsibility for the protection of North America in Canadian hands, and the nation placed military expansion and modernization as a top priority. By the war's end over 15% of all Canadian citizens would serve in uniform (out of a prewar population of 11 million) and Canada would possess the fourth-largest air force and fifth-largest naval surface fleet in the world. Canada's industrial contribution to the war was highly significant, particularly in the form of raw materials and motorized vehicles (Canada was the second-largest producer of wheeled vehicles after the United States). Canadian troops fought on all fronts in Western Europe, particularly in Italy and in France, during and after D-Day. Bordered on the east and west by expansive oceans, Canada is relatively secure from amphibious invasions if playing on the Allied side. Additionally, the United States is directly to the south of Canada. In a traditional game (i.e., the United States, United Kingdom, and Canada are all members of the same faction), Canada's geography virtually ensures that it is safe from attack. And if it is attacked, the United States is right next door to assist. Thus, Canada does not necessarily need to build up defensive forces on its borders. This allows Canada to specialize on a specific unit type that will help its faction. Alternatively, because it is in a relatively safe corner of the world, Canada can choose not to produce units, but instead funnel its production to countries on the front lines via the lend lease diplomatic action. Canada's special location on the map allows players to experiment with various strategies and decisions unique to Canada. Canada's geology and great size bestows the country with mineral wealth. Canada is an oil producing country. Its most productive oil fields were the Turner Valley oil fields which had been discovered on 14 May 1914. Production at Turner Valley peaked in 1942 at about 10 million barrels which constituted about 95% of Canada’s oil production and represented 0.48% of world crude oil production in 1942. The downside of the increased production was, as feared by the industry insiders, the lowering of the gas pressure, which ultimately shortened the productive life of the field. Canada starts with three of the four 1918 technologies, along with eight technologies from 1933, 1934, and 1936, and the two smallest ship designs, destroyer and cruiser, from 1936 and 1922, respectively. This means Canada essentially starts with most of the first tier equipment technologies. Canada also begins with technologies under the Grand Battleplan land doctrine and Fleet in Being naval doctrine trees. Notably, Canada also begins with Light Tank I (1934), the first step up from the 1918 Great War Tank. Canada begins as a member of the Allies. Assuming the player intends to remain in the Allies (i.e., not leave the faction), the player may generally choose to leave diplomacy with United Kingdom and United States on autopilot. In most cases, those countries will be Canada's top trading partners without diplomatic effort on the player's part. Canada begins the game with the democratic ideology under the leadership of Mackenzie King. Though there is very low support for these ideologies at the beginning of the game, it is possible to shift to fascist or communist ideology (joining the Axis awards the Canada First achievement in Ironman mode). If the Together for Victory expansion is active, Canada starts with the following National Spirits. Otherwise, Canada has no national spirits. By selecting this Design Company it will permanently affect capabilities on all equipment researched while they are hired. Limited Conscription requires "Commit to the War"
Extensive Conscription requires "Commit to the War" and "If Day"
Service by Requirement and higher require either "Forced Quebec Conscription" or "Compromise with Quebec", both of which in turn have "Commit to the War", but not "If Day," as prerequisites. Note that the Quebec conscription focuses are mutually exclusive with "War Fueled Economy," which completely removes the "Great Depression" modifier, although the modifier may be still be reduced through compatible focuses. The Canadian economy begins with five military factories, one naval dockyard, and thirteen civilian factories. It is recommended that the player prioritize the construction of civilian factories and research concentrated industry technologies in order to maximize the country's performance. Due to Canada's relatively low manpower pool, the player may want to consider developing well-equipped and highly trained armies. Alternatively, Canada's manpower and industrial potential can lend itself to efficiently provide warships and air wings rather than substantial ground forces in order to further its war effort. While Canada has a reasonable number of natural resources, they are also typically insufficient to field large numbers of vehicles without relying on imports (particularly oil and rubber). As such, civilian factories will often play an important role for Canada because of their use in trade. While paling in comparison to the United States, Canada has a moderately-sized army in 1936, made up of eight District Militia divisions comprised of nine Infantry battalions each and five Cavalry Militia divisions comprised of three cavalry battalions each. While they lack any armor divisions, they do have a single 1934 Vickers Medium Mark II stockpiled and are producing more. Unfortunately, the army is extremely under-equipped, with divisions only armed with 30% of the infantry equipment needed to operate at full capacity, but their five military factories and steel industry allow them to quickly resupply. The only obstacle preventing Canada from producing a formidable fighting force early on is its low available manpower, which is at 14.77K in the beginning of 1936. Canada's navy is very small, made up of only two 1922 Saguenay Class destroyers docked in Halifax. Their air force is also small, composed of a single wing of 24 1936 Fairey Swordfish naval bombers stationed near Ottawa. Have a good strategy for Dominion of Canada? This page was last edited on 13 April 2019, at 02:28.